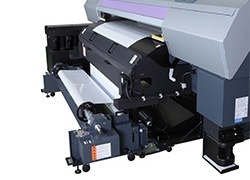 UJV500-160: wide format UV inkjet printer delivers high productivity with exceptional outdoor durability. The UJV500-160 can print at high speeds up to 60 m2/h. 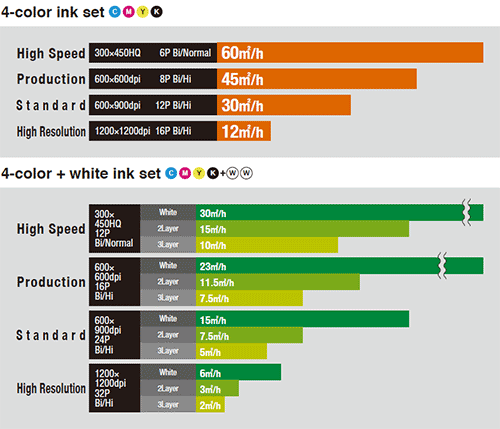 A speed of 24 m2/h can be reached while printing with white ink. The number of print heads and nozzles has been updated. The six 2 inch print heads are aligned in a staggered array, which is optimized to eject ink effectively. * The print speeds above are the results of printing on media with a 1,610mm width. Depending on the firmware setting, the print speeds above may not be reproduced. Curing efficiency has been improved due to renovating the LED-UV unit. In addition to being long-lasting and energy-saving, LED UV lamps do not generate excessive heat. This enables printing onto a wider range of materials, including heat-sensitive substrates, without media deformation. In addition to the normal pattern, you can select “MAPS” which effectively reduces banding. MAPS implements printing in a gradational mask pattern and diminishes the appearance of banding. * Depending on the setting of MAPS, print speed varies. Variable dot printing ejects ink drops in 3 different dot sizes. This smooth gradation without granular appearance is even achieved with 4-color printing. By pulling media down vertically, feeding errors are reduced, thus increasing print stability. This allows for continuous printing onto large media with a maximum roll diameter of 300mm and weight of 60kg. The high speed printing of the UJV500-160 enables high productivity. Additionally, the take up unit is positioned more towards the front than conventional printers, allowing media to be set more easily. Previously, repairs by service personnel were required when nozzle clogging was not corrected by cleaning. Now, the nozzle recovery system allows for printing to proceed as if the nozzle is not clogged, without slowing down the print speed. *The recoverability of this function is limited. The high media compatibility of inks opens a door to a wide range of applications for inkjet print signage. LUS-150 has the best curing property for high speed printing. This ink offers improved curing times resulting in a less tactile sticky feeling. This ink is flexible up to 150% resulting in increased elasticity and bending performance on a wide variety of media and substrates with little cracking. Additionally, white ink allows for printing on transparent film for window graphics. * As the flexibility of LUS-150 ink may vary according to the substrate, please verify your substrate in advance. A 3-layer print of color, white and color can be performed simultaneously. Printing a base layer of white ink reproduces the natural beauty of process colors that are printed on transparent substrates, with high precision and no multi-pass color registration shift. By periodically circulating white ink in the line, pigment deposition is prevented. This accomplishes stable production and reduction of ink discharge and waste. * MCT (Mimaki Circulation Technology) works only with white ink. Achieve high speed, high quality printing with the UJV500-160, along with guaranteed outdoor durability from 3M’s “3M™ MCS™ Warranty”. The long term warranty and the 200% flexibility ideal for curved surface applications open up new possibilities in the inkjet signage industry. * The 3M warranty is only applicable for Japan. Having an outdoor durability allows for installation of printed materials in places where regular maintenance is not possible, without worrying about deterioration. 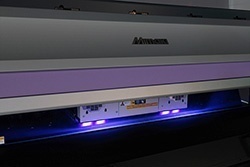 The new UV ink ”LUS-200”, which has been jointly-developed with 3M, can stretch up to 200% after curing. Since stretching will not crack the image, the LUS-200 ink is ideal for applications with curved surfaces such as vehicle wraps. 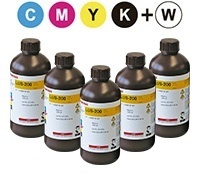 ・The flexibility of LUS-200 inks may vary according to the substrate, please verify your substrate in advance. When finished products are printed using the UJV500-160 printer and LUS-200 ink onto media specified by 3M, and are installed properly according to 3M’s instructions, the quality is guaranteed for the warranty period. ① Outdoor durability is guaranteed. ② When a warranty letter is needed, an application must be completed. Following this application, a screening by 3M will be performed. If approved, issuance of the warranty certificate will follow. * For further details, please refer to 3M’s guide “Certificate of 3M™ MCS™ Warranty Program”. * Warranty periods vary based on type of application, type of media, and graphic protection. UV curing generates minimal VOCs. LED UV ink is ozone-free. The LED-UV lamp generates very little heat. Unlike metal halide lamps, LED-UV lamps light up only where the image is printed, which leads to cost-effective production. As the life of the lamp is very long, both environmentally-friendly and economical production is supported. 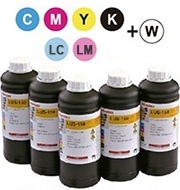 Each UV ink is supplied in a high-capacity bottle instead of a cartridge. This economical and ecological package contributes to reduce the amount of industrial waste and running costs. MDM, which removes nozzle trouble caused by bubbles in the ink, is employed. Ink that has not been degassed is supplied in bottles (the printer handles the degassing), both of which enable lower ink costs. Pagina oficiala a distribuitorului Mimaki in Romania-Bulgaria.